During winter our members witness how the environmental elements can make people’s experience of poverty and homelessness particularly gruelling. We see the damp and cold conditions endured by those attending our food vans, and during home visitations we assist individuals and families overwhelmed by sky-rocketing power bills, who face another dire choice, between heating or eating? These are short-term and wholly practical efforts on behalf of our members to give people a hand up and to overcome the loneliness and isolation that so often permeates the experience of poverty and homelessness. They are examples of faith in action and I am immensely proud to say they are carried out by the Society’s members and volunteers across Australia every day. 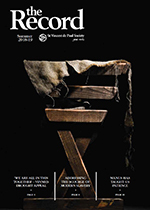 As Vincentians we strive to look the gloom of winter and the social ills squarely in the face and proceed with the work our founders, led by a young university student named Frédéric Ozanam encouraged by Blessed Rosalie Rendu, began in poverty-stricken Paris 185 years ago. 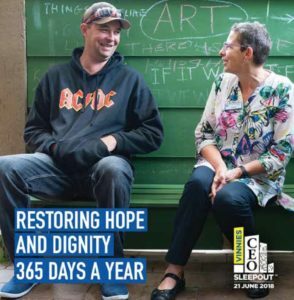 It is not a coincidence that the Society in Australia today is involved in such a broad range of projects, from housing services to prison visitation, after-school reading programs and much more. Advocacy campaigns run by the St Vincent de Paul Society aim to complement actions of those on the ground by highlighting the root causes of the social ills we work so tirelessly to address. For instance, on Palm Sunday Vincentians joined thousands of people of all faiths and backgrounds in demonstrating their growing concern about the treatment of refugees and asylum seekers. And in June, we held our Vinnies CEO Sleepout to bring greater community awareness to the issue of homelessness, raising approximately $6.8 million towards our homelessness services. With the latest statistics showing the rate of homelessness in Australia continues to grow, more than 17,000 Australian children under the age of 12 have no permanent home, there is clearly much more that needs to be done. All Vincentians serve in hope. There is cause for hope and it has many faces. Within the Society itself, we have made great inroads in encouraging young Vincentians—some of whom are at university just likeFrédéric Ozanamand his companions were—to take a lead role, a need identified at our National Congress held last year. It is my fervent hope that we will have the courage to listen to our founder’s call in a new age and that long into the future young people will be filled with the Spirit, celebrating the changes the Society has helped make and challenging us to change again. Vincentian prayer calls us to find even more new ways to put our calling into practice for the benefit of all. Together, let us reshape our world and share the good news in new ways, true to the vision of our founders, especially Blessed Frédéric Ozanam. Graham West is National President of the St Vincent de Paul Society National Council of Australia.